Fantastic results at Wiltshire Grades! 27 WWG gymnasts competed at the Wiltshire Grades competition, held at WWG, on Sunday 20th November. 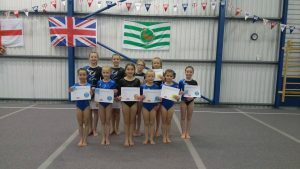 All 27 gymnasts passed their Grade, with 7 gymnasts achieving Distinctions: more than any other Club at the event! Special congratulations to Ava Britten and Jasmine Stone (1st and 3rd at Grade 4), Aoife Bolland (2nd at Grade 3), Tabitha Coleman, Leona Britton and Mya Brown (1st, 2nd and 3rd at Grade 2) and Isabelle Kerbey (1st at Grade 1).